The combination of hard and soft material components used in the uvex ultrasonic pairs high mechanical strength with optimum wearability. This wide-vision goggle can be worn for long periods without causing any pressure problems. The flexible soft component allows it to adapt to each individual face for a snug fit, ensuring comprehensive side protection around the eye area, even when worn over prescription spectacles. The uvex ultrasonic offers outstanding ventilation, ensuring a pleasant interior environment that does not cause irritation. This top goggle also features a sporty design, panoramic field of vision and quick and easy lens replacement. 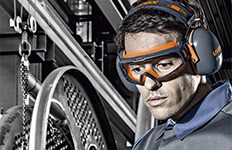 The welding safety version of the goggle has a practical flip-up lens that is very easy to replace. Not suitable for electric welding.